As celebs rolled up to tonight's MTV VMAs, the No. 1 topic of conversation was Kanye West. The rapper was confirmed for at least four minutes of airtime -- not necessarily as a presenter or a performer. But as something. On the red carpet, everyone wondered what he was going to do. Some thought he'd drop a new song; some thought he might tease new clothes or shoes. Others, like Diddy, were just certain he'd entertain. 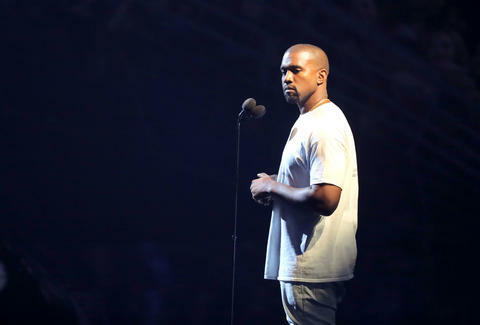 After almost an hour of VMAs action and anticipation, Kanye delivered. An excerpt of "Famous" played in the background as he hit the stage. "I am Kanye West, and that feels really great to say, especially this year," he said. "I came here to present my new video, but before I do that, Imma talk." The talk was part promo, part activism, part brag. Yeezy patted himself on the back for the staging of his contentious "Famous" visuals, and called out Taylor Swift and his ex Amber Rose. He said his wife was a G, praised Beyoncé, shed light on violent crime in Chicago, yelled the word "bro" a lot, and saluted his idols -- including himself. "My role models are artists, merchants," he said. "There’s less than 10 I can name in history: Truman, Ford, Hughes, Disney, Jobs, West." What came next was the world premiere of his "Fade" music video, featuring singer-actress Teyana Taylor -- and feline imagery. The VMAs' audience whistled and cheered. Masters of ceremonies Keegan-Michael Key and Jordan Peele were appropriately baffled. Kanye's new video comes a little over a week after the opening of his Life of Pablo pop-up shops. Twenty-one of the stores, promoting his February album and latest fashion items, had opened across the globe. His "Saint Pablo" tour, celebrating the same record, kicked off last week in Indianapolis (full schedule here). He next flies to Toronto. Watch "Fade," in all its Flashdance-inspired glory, on Tidal. It's like a Snapchat filter come to life. Sean Fitz-Gerald is a staff writer at Thrillist Entertainment, and is thankful for Kanye always. Find him on Twitter: @srkfitzgerald.